The Leicester Asian Glitz Awards 2018 is an award ceremony that celebrates art, media and entertainment in Leicestershire. This will be the 2nd year for these awards after a hugely successful awards ceremony last year 2017. Leicestershire has a fantastic array of talent and we at Jay's Entertainment want to celebrate it. When and where are the LAGAs? 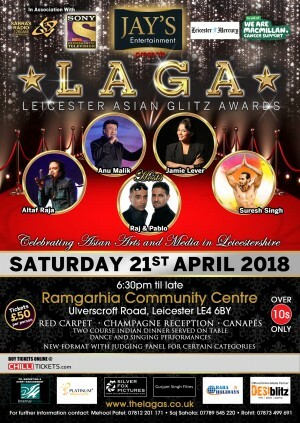 The LAGAs 2018 are taking place on Saturday April 21st at the Ramgarhia Centre in Leicester. Nominees, sponsors and the audience are asked to attend at 6.30pm, with the awards finishing late into the night. Over 10's only and smart wear and 3 course meal. 6.30pm: We start with a red-carpet entrance where the audience and nominees will have a chance to take photographs. 7.00pm: Inside, we have a Prosecco reception and beautiful canapés. 8pm: Our award ceremony begins – presenting awards including “best male singer,” “best female dancer,” and the coveted “Leicester Lifetime Achievement Award.” We have dinner and dessert served across the awards as well as honorary speeches, dance, singing and comedy performances. Late: What we can promise is a lot of fun, glamour and glitz! We are pleased to announce 4 celebrity judges, 'ANU MALIK', 'JAMIE LEVER', 'ALTAF RAJA' and 'SURESH SINGH' on the night who will judge and announce the winners for the 'Best Singer Male', 'Best Singer Female', 'Best Dance Group' and 'Best Comedian' live on the night! We have plenty of entertainment across the evening including international Suresh Singh's dance group and Leicester-based singers & dancers. Also performing on the night will be Altaf Raja, Jamie Lever and Anu Malik!